* AIG - a company that should have failed during the 2008 crisis. * Deutsche Bank - a company that seems to be following the Lehman playbook word for word. I won't bore you with all of the details so we can focus on what is happening right now. The market is not sure if DB will survive and they are cutting back their exposures (trading, deposits, counterparty activities) to DB. This has a snowball effect of weakening DB further, causing more speculation about their future, etc, etc. The EU seems very divided on the issue of saving DB (who has a the largest derivatives exposure of any bank in the world) and it's my hunch that this will get worse before it gets better. Ultimately, I believe Germany would step in to save them but I don't believe the broader EU will offer much support. So why do I care about some German bank? Well, they are the largest investment bank in Europe, they have $1.8 trillion in assets, they have ties to every major bank around the world which makes them perhaps the most systemically important bank and they have notional derivatives exposure of somewhere around $51 trillion (yeah, with a T - that's real money). The markets are clearly concerned about DB right now but the broader EU banking industry is in trouble. I have serious concerns about the health of some Italian and Spanish banks and DB's issues might be the catalyst that starts a wave of banking issues across the EU. It will be interesting to watch this play out and much like in 2008, every headline about a bailout or non-bailout may swing the markets substantially. ** Update - after being down nearly 9% DB shares are now up slightly on the day after a series of twitter rumors started gaining steam. The rumor is that the Dept of Justice in the US would be willing to negotiate a lower settlement over fraud allegations ($5.4 bil vs. $14 bil) to help stabilize DB. Well, if we've learned anything it's that we must save the banks at all costs, right? So, roughly 2 weeks ago, Wall Street threw a one day panic in an attempt to swing some on the fence voters at the Federal Reserve. Stocks plunged a whopping 2% from all-time highs and it seemed like the end of the world. We spent the next two weeks bouncing around as various entities tried to assuage the markets. Well, yesterday we finally, got the word that yes, everything is indeed awesome and the US economy is cranking along perfectly but we still have to keep interest rates at historically low levels because even a minor uptick could cause the Great Depression 2.0 (ok, there's a little sarcasm in there). However, Wall Street's panic attack seems to have worked and they got what they wanted. No rate hike and a 1% jump in stocks (which looks to be followed by a push back to near all-time highs today). The disconnect between the markets and the economy grows wider by the day and the Fed has no exit plan in my opinion. For example, in the Fed's own words yesterday they cut the 2016 GDP forecast to 1.6-1.8% and cut the long-range sustainable growth of the US economy to 1.7% to 2%. However, this weaker outlook was one of the catalysts cited by many as spurring the buying in yesterday's market. Yes, a weaker long-term outlook for the US economy is cited as a reason you should buy stocks. However, while the markets remain fixated on the Fed's moves, there is something that bears watching. The London Interbank Rate (LIBOR for short) has been spiking since mid-summer as a result of some regulatory changes. This is effectively tightening money supply without the Fed's input and I think many people have underestimated its impact. While the Fed gets all of the headlines, the LIBOR sets the base rate on some $350 trillion (yeah, with a T) in debt. This movement is going start really pinching companies with floating debt just as the economy starts to falter (October/November). Since Friday the markets have been about as stable as a presidential candidate in sweltering 79 degree heat in NYC. As a reminder, when last we left off, the markets tumbled 2.5% on Friday as a warning to the Fed that they better not raise rates. Conveniently, three Fed governors spoke on Monday and told everyone to relax, they won't be doing anything crazy like raising rates and markets roared back (up another 1.8% or so). Well, today the Fed enters their quiet period (thank goodness) and without anyone to talk about how awesome things are while simultaneously maintaining emergency levels of support for the markets stocks have almost given up all of Monday's gains. We went through a period of unusual calm this summer - close to 40 days without a 1% swing in the markets - and that seems to have come undone overnight. Those that follow the order flow closer than I do, say that there is a ton of "spoofing" or false orders in the market right now (ie, in Silver between 3:30am and 4:30am someone place 200+ buy orders and canceled that same order 200+ times) and they say that it's like someone "flipped the crazy switch" on the markets. I'm not sure what to make of it right now but it's worth following. 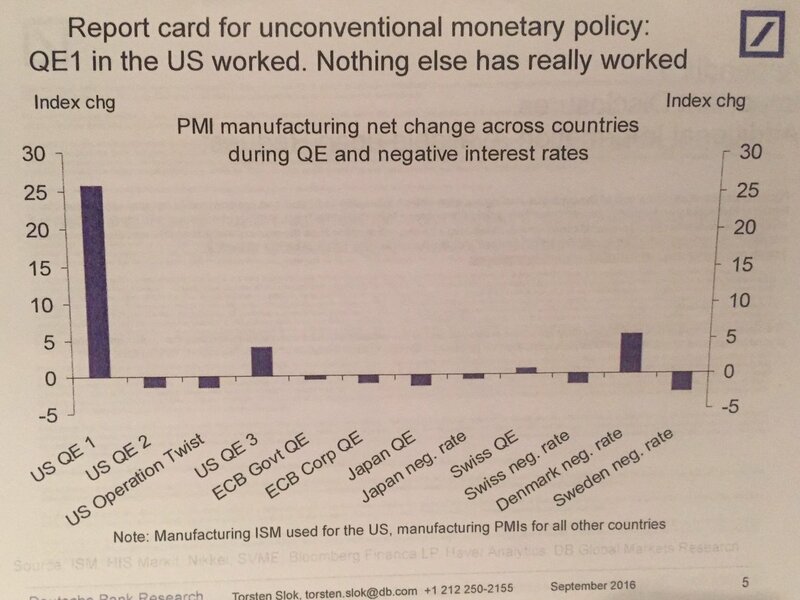 BTW - As we are debating whether or not the Fed can come to our rescue again - note this chart from Deutsche Bank. Basically, since the end of QE1 (3/2010) none of the subsequent Central Bank programs have moved the needle to drive growth. 1) A Fed Governor making statements in support of gradual rate hikes. However, none of these factors really could be labeled as a cause of a 2.5% sell-off. I go back to the tried and true "temper tantrum" excuse. Each time the Fed and other central banks have toyed with the idea of returning to a normal rate environment, the investing community has panicked as a group sold stocks hard and called the Fed's bluff. With a Fed meeting coming up in less than 2 weeks and despite a tremendous amount of evidence pointing toward economic weakness, the Fed has a 30% chance of pulling a shock and awe move by raising rates. While, I believe that isn't likely this Fed is about as disconnected from reality as one can be so who knows. I think Wall Street wants to remind the Fed that their primary objective is no longer inflation control or employment stabilization but rather maintaining the S&P 500 near all-time highs. The overnight futures look a little lower, however they are already bouncing a bit, but if history is any predictor (it shouldn't be, but it is with today's computer driven mkts), when the markets fall 1.5% or more on Friday, they are also down on the following Monday roughly 90% of the time. * Deutsche Bank posted some observations on the state of the US economy. "In the current business cycle, margins peaked at $18,752 per worker in Q4 2014. This compares to a ratio of $16,487 per worker as of Q2 2016. Margins have fallen because corporate profits have declined -6.3% annualized over the past six quarters,"
* One of the issues I have with any state fighting to protect jobs at an aluminum producer (Alcoa in our case in NYS) with additional tax incentives and electricity rate adjustments is that we are fighting an arms race that we can't win. Consider that since 2010 Chinese aluminum output has DOUBLED, US imports of aluminum jumped from 14% to 40% of total supply and the number of US smelters has fallen from 23 to 5. China is racing to the bottom of this industry but that doesn't mean we have to follow them down the well. In a related story, there was an article this weekend that discusses a massive aluminum stock pile in the Mexican desert. "Two years ago, a California aluminum executive commissioned a pilot to fly over the Mexican town of San José Iturbide, at the foot of the Sierra Gorda mountains, and snap aerial photos of a remote desert factory. He made a startling discovery. Nearly one million metric tons of aluminum sat neatly stacked behind a fortress of barbed-wire fences. The stockpile, worth some $2 billion and representing roughly 6% of the world’s total inventory—enough to churn out 2.2 million Ford F-150." 6% of the TOTAL Inventory just sitting there ready to hit the market. It appears that the stockpile has been set aside by a Chinese billionaire in effort to control a flooded market to some degree. * Class 8 truck orders - tractor trailers/dump trucks - have fallen on a year over year basis for 18 straight months. They are back at the lowest levels in 5 years. Some of this is the natural order cycle and some of this is attributable to reduced demand for trucking capacity. *Earnings for the S&P 500 companies have fallen now for 5 consecutive quarters, while stocks remain at or near record highs. The last time earnings fell like this was 2009. * The year over year change in average hours worked has fallen to levels last seen in 2009 (So, 2008/9 will be a consistent theme). * Rail volumes tumbled another 7% in the latest quarter and have fallen for 17 consecutive months. This is principally driven by declining crude shipments but traditional rail freight is also declining. * Most of the major US markets remain within a 1% of their all-time highs. Despite the plethora of data that indicates a slowing US economy. The belief that the Federal Reserve will (and CAN) continue to support equity prices is now the only investment thesis that matters. * In the past 40 days, S&P 500 has traded in a range of only 1.77% (using closing prices). That is the tightest 40 day range EVER going back to 1928 (did anything happen in 1929?). Increasingly, the markets are swinging + or - 0.5% multiple times per day but by the end of the day, the markets are nearly flat. This is in the face of a tremendous amount of data that should have moved stocks meaningfully. This complacency is troubling. * Earnings estimates for the coming 12 months of the largest stocks in the world have a 20% spread versus their actual earnings. This is the widest margin since 2009 (hmm, there's that year again). *The 7th largest container shipping company filed for bankruptcy last week. The impact on global supply chains will be felt for some time. When your favorite made in China toy isn't on the shelf this Christmas season, you'll know who to blame. There is a story starting to circulate in the mainstream media on falling food prices in the US. This is at best a bit of lazy journalism or state sponsored propoganda at worst. As the story goes, farm staples - eggs and milk - are tumbling in price so consumers are able to save massive amounts off their monthly bills (though you'd have to eat a LOT of eggs for that to be the case). "American shoppers are enjoying what could be the longest streak of falling food prices in a half century. That’s good, if you’re buying a shopping cart full of groceries, but it’s not so good for farmers. Heather Buen said putting food on the table has gotten easier. “I would say I can save anywhere from about $25 to $50 sometimes on my grocery bills in comparison to last year,” she said. The average price of a dozen eggs has dropped from $2.57 last year to a $1.54, down nearly 40 percent. A gallon of milk is about 40 cents cheaper..."
Okay, so let's look at this and separate fact from fiction. Yes, egg prices are collapsing (I'll get to that in a minute) and milk and beef prices are down slightly, however, if you ask anyone that shops on a regular basis they can identify 10 items that have risen in price over the past year for every 1 item that has fallen. All fruits and vegetables are up 20-30% from last year and most processed foods are up 5-10%. The idea that grocery bills are shrinking is insulting to anyone that has to put food on the table for a family. Eggs - I mentioned this recently to my Mom because I purchase a lot of eggs and it's a commodity much like corn, orange juice concentrate or even oil - you know what the market pays. If you remember last summer there was a large outbreak of Avian flu in the Midwest. This lead to a huge reduction in the number of laying hens as flocks were culled (at least 50 million by some estimates). This caused prices of eggs to spike wildly last year and I paid a peak price of $2.24/dozen last year at the height of the bird flu. Well, fast-forward a year and all of those birds have been replaced and probably a few more. Apparently, new chickens lay more eggs than older chickens (side note: in the era before incubators new chickens were born in the spring and commanded a higher price b/c they laid more eggs but some sellers would try to pass off older chickens as new chickens to increase their profits. Thus, the origin of the phrase "that's no Spring chicken"). If you replace 50,000,000 chickens in the US at one time and you will create an egg glut the following year. Last week I paid $0.78/ dozen of eggs at retail as a result of this glut. There is one other potential cause of this glut - the Federal Reserve. One of the side-effects of the Federal Reserve's war on interest rates is that it encourages more borrowing at ultra low rates. Maybe instead of adding 25,000 chickens to replace the birds you lost, you borrow money and add another 2 barns and add 150,000 chickens. If you make that decision in a vacuum you might be okay, but if you make that decision along with 500 other egg farmers in the US who all make the same decision at the same time, well, now you have a glut. Last year when egg prices were soaring the story was "well, that's not inflation because it's a one time event". Now when prices are falling, again most likely because of a one-time replacement of chickens, the media wants us to buy that it's great for consumers even if their $1.46 in savings are eaten up by higher hummus, black bean, apple or lettuce prices. **** I have about 30 stories queued up ready to roll on the state of our economy, but I'll try to cover a few topics in each post so I don't flood your inbox. Quick summary - I'm not sure I'd want to be running for President because I believe by the time Q4 2016 or Q1 2017 rolls around we may be in a recession.